A:This product is 1.5m dia for adult , if you want to buy other sizes, please click the link below. What’s the material of the ball? A: The materilal is 0.8mm Plato PVC.If you want to buy TPU material,Please click to buy. Is the pump(air blower) included? A: Not included, if you need it, please buy it additionally.Please click to buy. Is there any guarantee for the products? A: 1 years Quality guarantee to avoid your after-sale-service risk and free repair kit. A: You can press numbers and your own logo for free. What countries do you ship your products to? A: The whole world. When is the estimated time of arrival? We promise that the item will arrived within 14 days after payment. How to pay? A: Currently, you can pay using Visa, MasterCard, Western Union, Qiwi and bank transfer. More detail,please click for help. How about import duties,taxes and charges? A:Please be noted that import duties, taxes and charges are not included in the item price or shipping charges. Please check with your country’s Customs Office to find out what additional costs will be before place an order. Playing instruction:	1.Make sure no sharp things on ground when playing the game. Need a carpet on the common ground. 2.It is forbidden to carry with keys and mobile phone, glasses and sharp small decorations during the playing. 3.Make sure to check the bubble soccer is in a good condition,belt and handle are firm before playing. 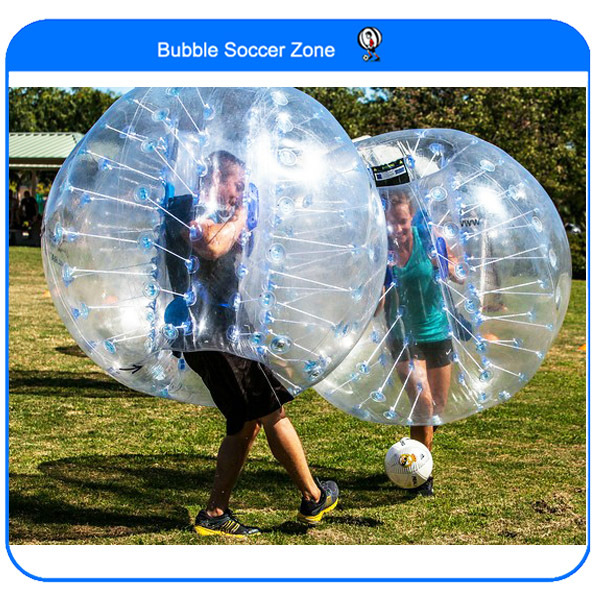 4.Please keep the sign “UP” on bubble soccer in right direction, Do not slide in the bubble soccer in a wrong direction. 5.Player should be in belt, hold the two handles. 6.Children should play with the accompany of adults. Security activities Note:	1.It is for bidden to use in rain day, and the wind above level three. 2.Age of 65 should not participate. 3.People with heart disease, high blood pressure and physical weak shall not play it. 4.Weight preferably not more than 100 KG	Guarantee:	1.We test each bubble soccer for 3 days to ensure the ball exactly well. 2.We will guide you to repair the ball during all the life span of the ball. 3.The quality guarantee period is 1 year.